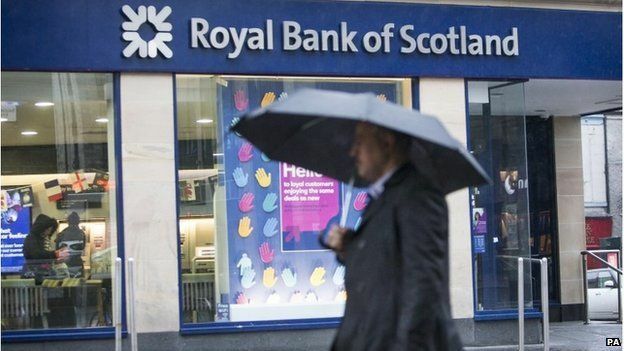 Royal Bank of Scotland has reported a half-year loss after setting aside more money for repaying customers and potential legal settlements. The £153m loss for the six months to the end of June compares with a £1.43bn profit a year ago. Restructuring costs almost tripled to £1.5bn amid efforts by chief executive Ross McEwan to cut staff and refocus the bank on the UK. The lender set aside £1.3bn for lawsuits and customer recompense. Another £459m was earmarked mainly for litigation costs in the second quarter. Most of those are likely to arise from sales of mortgage-backed securities in the US, said the bank. In May, RBS and Japanese bank Nomura were ordered to pay $806m between them for making false statements when selling the mortgage-backed bonds to US agencies Fannie Mae and Freddie Mac. The bank’s net profit rose to £293m for the three months to the end of June. RBS was one of six banks fined a total of about £2.8bn for failing to stop traders trying to manipulate currency markets last year. RBS has already paid £399m in fines to US and UK regulators over the forex scandal. The bank’s capital strength improved after selling a stake in US lender Citizens. Costs for the bank have fallen, which finance director Ewen Stevenson attributed to smaller staff costs and “getting out of expensive real estate” on a conference call with journalists. Shares in RBS rose 0.8%, or 2.8p, to 356p in afternoon trading in London, making it worth £41bn. The stock is largely unchanged compared with the same time last year. The government remains the biggest shareholder in RBS and Chancellor George Osborne wants to start selling shares in the bank by the end of the year. The first sales could come as soon as September.